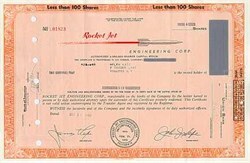 We are offering this historic and beautifully engraved authentic Stock Certificate issued by The Rocket Jet Engineering Corporation for shares of common stock. This cancelled document has an ornate border around it with a great a vignette rocket traveling sideways. This certificate was issued at the time of the Cuban Missle Crises ( 1961 - 1962) and is over 38 years old and is in good condition. This will make a nice historical addition to your collection or a fun gift for someone special.